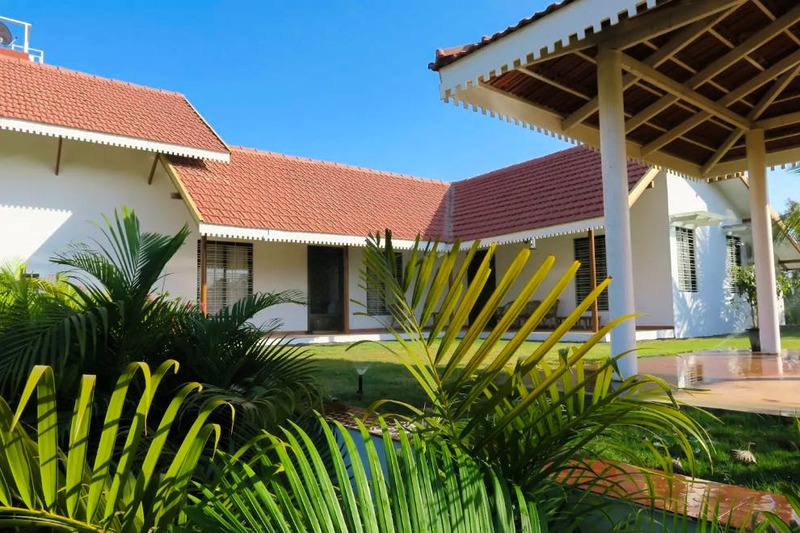 A massive farmhouse equipped with all sorts of amenities including a pool, sprawling fields, and spacious rooms, The Green Estate farm is in Matori, a small village 10 km away from the city of Nashik. Mumbai to Nashik is about three-and-a-half hours away by road if you choose to take your own car, which will be advisable because this villa is situated 10 km away from the main city. But Nashik from Mumbai is well connected through public transport too. Trains run on this route from CST, Dadar and Lokmanya Tilak Terminal at regular intervals and the travel time is anywhere between 3-4 hours. There are buses that ply on this route as well. Once in Nashik, you can catch hold of local transport and head to Matori where this villa is. Spread over 5,400 square feet, the villa has a spacious living area along with four air-conditioned rooms that can together accommodate up to 12 guests. With a fully equipped kitchen and indoor games like table tennis, carrom, and chess the house has enough to keep you engaged. Step out, and there is a well maintained (cleaned and filtered regularly) swimming pool for you to plunge into. The nicely pruned lawns are fit for a brisk evening walk, or if you want to run around playing chase, basketball, lawn tennis, cricket or badminton. If you’re thinking sporting gear, fret not as the villas has all of it ready for you. The villa is perfect for large get-togethers with family and friends away from the humdrum of the city and in the lap of the nature. They even have support staff to cook you a nice meal in the house itself (only till 10 PM, though). In case the number of guests exceed the bed capacity, they will provide for extra mattresses at extra cost (INR 1,000 per mattress per night). Considering the villa is in a village, they don’t allow playing loud music or having noisy parties on the property. And smoking too is not allowed here. But keeping those minor things aside, the villa offers an ideal space for unwinding and rejuvenating so you can muster the energy to get back to your hectic routine. The price for one night for the whole villa is INR 13,000. If Mumbai’s forever active life is draining you out, then add this to your travel list, and head out even if its just for a day. The quaint surroundings and fresh air will leave you relaxed for sure.